Raheem Sterling was born in Jamaica on 8th December 1994 and joined Liverpool from Queens Park Rangers in February 2010 for £600,000. he has represented England at Under 16, 17, 19, 21 and full international levels. Initially for Liverpool Sterling was a star in the academy with stories coming out about this kid who was showing exceptional,promise flying down the wing and who could score goals. He was playing for the Under 18s but quickly found his way in to the Under 21s team again producing a string of exceptional performances usually on the left wing, it was also noted that he was regularly on the scoresheet for both the youth team and the reserves. Sterling was rewarded for his level of performance at the academy with his debut as a substitute against Wigan Athletic in March 2012 aged just seventeen. 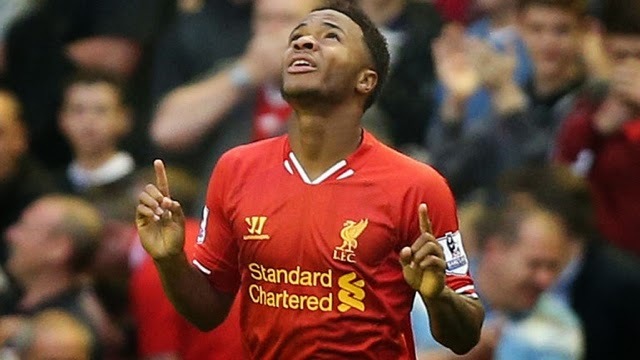 It was the 2012/13 season that Sterling made his big breakthrough into the first team making a total of 36 appearances, scoring a couple of goals, a superb first full season for such a young player. The following season 2013/14 started poorly with Sterling not producing the high level of performance that was now expected and saw many supporters believing he should be loaned out, and the manager dropping him from the first team, but in December he was recalled scored against Norwich City and then two more later in the month in a stunning performance against Spurs and he has never looked back, finishing the season with 37 appearances and an impressive 10 goals and winning great reviews playing for England in the World Cup finals that summer, possibly the only England player to come out of the tournament with any credit. Still young Sterling has a growing reputation throughout Europe and World football and is still very young. His pace and trickery with quick feet are his main attributes but is also showing that he can pass both long and short and that he can finish, he is quickly developing into an all around attacking player. Despite being very slight he has developed incredible strength through hard work in the gym and is very difficult to knock off the ball. throughout his early years at the club Sterling's private life was becoming a problem with his name constantly appearing in the papers with various women claiming he was father to their children and two cases of assault on women, in August 2013 he was arrested for an alleged assault on his model girlfriend, he was found not guilty at Liverpool Crown Court a month later. It is worth noting that this court case coincided with his loss of form and him getting dropped from the first team. He had previously been arrested for an assault on another woman but this was dropped when the prosecution failed to provide any witnesses, the prosecution were made to pay his court costs. It is worth noting that Sterling was innocent in all of the above cases and has done nothing wrong and recently things have gone quiet as he has focused on his career. In my opinion there is no doubt that Sterling will go on and be a world class player, he has the world at his feet literally, he is already one of the first names on the Liverpool team sheet and will be for years to come. He is making a name for himself at international level and I'm sure he will continue to develop and become an important member if the England team for years to come. he is a Liverpool legend in the making.